This past weekend the temperatures hit 70 degrees in Boston. Of course, it is back to being 44 degrees and rainy today, but oh well. That sunny, warm day got me all ready for the fruity, tangy and sweet treats that I have craved all winter. I have never been a huge pie fan, but when it comes to a raspberry/blueberry/any berry bar or crumble and I have my fork ready. But of course, I wanted to make it a little less sweet, remove the gluten, but still keep it easy. First, let’s talk the crust. When it comes to crust, I will always prefer shortbread crust to pie crust. I don’t know why, but that crumbly dough is a better carrier for all sorts of tasty toppings. But getting the texture right without grains can be tricky. I tried a few flour combinations: almond flour and oat flour, almond flour and arrowroot, almond and tapioca, and just almond. None of them had the exact texture that I wanted. Then there was the coconut flour and almond flour. Coconut flour absorbs the moisture, binds and adds sweetness as well (so less added sugar is needed). The secret to this crust is also the touch of cinnamon. The cinnamon gives the crust a little bit extra depth and more of a ‘wheaty’ flavor (if that makes any sense). Just a bit of sugar. In my opinion, the fruit in this dessert is the real source of sweetness. However the crust does need a little something to sweeten it up. Coconut sugar is my go-to sweetener and it is perfect for the crust. It has a little bit of moisture in it, adds a darker color and rich caramel flavor to the crust that goes perfectly with the cinnamon. I would not recommend using a liquid sweetener like agave or maple syrup. If you are Keto, you can substitute golden monk fruit, but only use 2 tablespoons. Monk fruit is very potent. I tend to always keep a stash of frozen fruits and veggies in freezer at all times, ready to be mixed into smoothies, blondies and something savory. 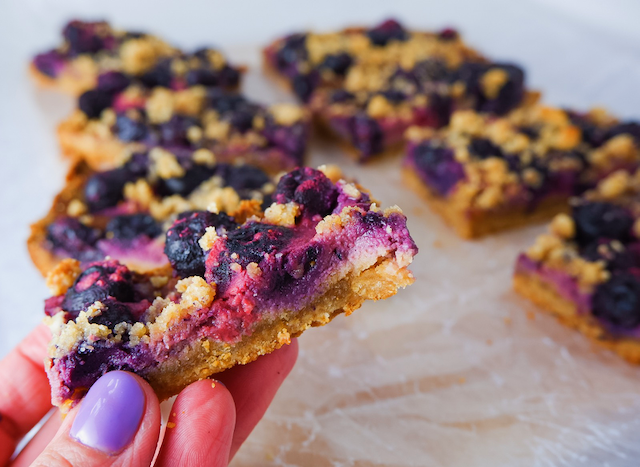 I alway have frozen, wild blueberries in my freezer and they are perfect for this treat. If another fruit strikes your fancy, mix it up. This treat would be great with strawberries, cranberries, blackberries or even mango. Any fruit you want. If you prefer to use fresh fruit rather than frozen fruit, go ahead. If you are using fresh blueberries or strawberries, I’d recommend roughly chopping the fruit. Additionally, you might need to add a little bit more coconut flour. Preheat oven to 350F and line an 8in baking dish with tin foil or parchment paper. In a large bowl, combine the almond flour, coconut flour, coconut sugar, sea salt and cinnamon. Whisk to remove any lumps and combine. Stir in the melted vegan butter or coconut oil. Keep mixing until everything is moistened and you get a wet dough that rolls into a ball and holds it shape. Put 3/4 of the dough into the baking dish and use your hands to press into the bottom of the baking dish until it is fully covered. Bake for 15 minutes or until the edges just start to brown. While the base is baking, place the blueberries and lemon juice into a medium, heatproof bowl and microwave for 2 minutes. You want some of the juices to come out. Mix in the coconut flour and let sit for 10 minutes. Once the base is ready, pour the blueberries over the base and spread so they are evenly distributed. Crumble the remaining crust dough on top of the blueberries and bake for another 20 to 25 minutes. Let cool completely before slicing; these are delicious at room temperature with a drizzle of almond yogurt or your favorite dairy-free ice cream. Storage tip: keep in an airtight container in the fridge for 1 week or in an airtight container in the freezer for 2 weeks.